FAW PREMIER CUP FINAL Wrexham 6-1 Newport Wrexham: Lawrence (1), Morrell (12), Whitley (21), Trundle (32), Pejic (68), Trundle (72) Newport: Shephard (78) Att: 4,014 The Dragons added the FAW Premier Cup to Division Two promotion after outclassing Peter Nicholas' side 6-1 at the Racecourse. Goals from Dennis Lawrence, Andy Morrell, Jim Whitley, Shaun Pejic and Lee Trundle (2) ensured that Newport would not add Wrexham to the Nationwide scalps of Swansea and Cardiff they had taken in the previous rounds. Garry Shephard scored an excellent goal for the visitors, but by then the game was out of sight. Wrexham have now won the Cup four times out of the six times the competition has been run, and the £100,000 prize money will be a welcome boost to manager Denis Smith as he battles to secure his 14 out-of-contract players for next season's league campaign. Wrexham manager Denis Smith The visitors had the worst possible start, young goalkeeper Gareth Wesson giving away an unnecessary corner in the first minute. A teasing Scott Green cross was met strongly by Dennis Lawrence and, despite a desperate attempt from Andrew Thomas to keep the header out, it drove over the line. 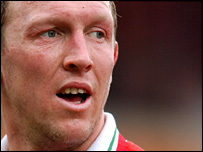 Wrexham's record-breaking striker Andy Morrell was next on the scoresheet. He ran at a host of County defenders who backed off the marksman, allowing him to chip Wesson from the edge of the area. It was Morrell's 39th goal of the season, and his 19th in the history of the FAW Premier Cup, comfortably ahead of his nearest rivals. 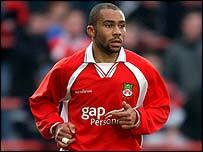 Whitley profited from Carlos Edwards' pace Carlos Edwards' pace opened County up down the right on 20 minutes. The wing-back took the ball to the goal line before sliding it into Jim Whitley's path who fired home the third. Ten minutes later Lee Trundle beat Jeff Eckhardt to a long ball, but looked to have lost his chance as he delayed on the edge of the area. His skill saved him, though, as he teased Jason Perry before sliding the ball in to the right corner past Wesson, leaving it 4-0 at half-time. Newport battled bravely for 25 minutes of the second half, but the possession and territory were all with the home side. The fifth goal came from the unlikely figure of young central defender Shaun Pejic, who was on hand to turn in Scott Green's centred ball. Newport manager Peter Nicholas Just four minutes later man-of-the-match Trundle added his second, spinning on the edge of the area to buy himself half a yard before curling the ball into the left corner. It was the dangerous Garry Shephard who at last got the Doc Martens League Premier Division side onto the scoresheet, chasing a long ball under pressure from the defence before lobbing beautifully over the keeper to the far post. Wrexham manager Denis Smith said it was the visitors' positive attitude that helped his side. "Newport made it a game and went at us, but it meant we were able to go after the spaces they left behind," he said. "The lads showed a tremendous attitude, I want to keep these players together to do well next season." Newport manager Peter Nicholas had no complaints: "With Wrexham on such a rollercoaster ride it was always going to be difficult to come here," he said. "They were excellent - I've got no complaints." Wrexham: Paul Whitfield, Shaun Pejic, Dennis Lawrence, Brian Carey, Paul Edwards, Carlos Edwards, Paul Barrett, Scott Green, Jim Whitley, Lee Trundle, Andy Morrell. Subs: Kristian Rogers, Craig Morgan, Shaun Holmes, Steve Thomas, Lee Jones. Newport County: Gareth Wesson, Andrew Thomas, Jason Perry, Jeff Eckhardt, Chris Collins, Steve Benton, Michael Fowler, Matthew Rose, Nathan Davies, Garry Shephard, Neil Davis. Subs: Lloyd Stone, Raith Plant, Chris Rogers, Allan Stevenson, Mark Dickeson. "We went at the spaces they left behind"
"I've always said I'd like to stay here"